My first INBOUND experience was exciting, surprising, and inspiring! I was so excited by the variety of the sessions I could choose to attend every day. Apart from being surprised by how big the event was taking up the whole of Boston Convention and Exhibition Centre, I was also inspired and motivated by the conversations with like-minded inbound marketers. It was epic! For anyone who has never heard about it, INBOUND is an annual conference held by HubSpot in Boston. Each year, marketers working in the various industries from different countries gather together to share their knowledge and experience in marketing and, of course, to learn the latest updates of HubSpot marketing automation system. This year, over 24,000 marketers attended this event and more than 300 sessions were presented by industry leaders and HubSpot professionals. Video marketing isn’t new. What’s new is that video can be your next level communication tool. Video is to create a one-to-one personal experience. It is not merely a marketing tactic, but a business strategy. Now companies can use video across a company's marketing, sales and customer service teams to provide personalised content to customers. Sales and marketing professionals constantly in communicate with prospects through emails, phone calls, video conferences, or even on social media. The role of sales shifted from order takers, explainers to a more of consultancy. It is essential to create a Clear, Compelling, and Concise (3C framework) message to effectively engage and communicate with the prospects and customers. Evaluate repetitive, manual marketing tasks that could be intelligently automated. Access opportunities to get more out of your data- discover insights, predict outcomes and devise strategies. Consider the AI capabilities of your existing marketing technology stack. Regardless of how popular the social media channels are, Google search is leading in creating website traffic. Mobile-friendly, page speed, schema markup, meta descriptions, title tags are still the fundamental technical SEO matters everyone should pay attention to. Create unique, relevant content that answers questions of your buyer personas. Make your first impression on Google attractive: good reviews, eye-catching videos and images. You can also follow the Maturity Model to provide guidance for diagnosing clients' SEO capabilities. My favourite session was the co-founder's keynote. It was so inspirational and insightful. To be honest with you, I’ve never fully agreed with the funnel model. I disliked the idea of filtering the right-fit customers out of prospects through devised layers of marketing and sales activities. As a result, you might gain a number of customers as a salesperson, but you lose the trust of being a quality marketer. Why? Because you have achieved your goal of getting the revenue up but you failed to take care of these customers and, more importantly, to grow with them together. Years of working in the user experience and customer-centric marketing communications field, I always put or try to put the customer satisfaction at the heart of everything I do. Yes, it is “customer satisfaction”, not just “customer”. We all know how costly it is to acquire new customers and how powerful WOM (word-of-mouth) is in today’s competitive business world. 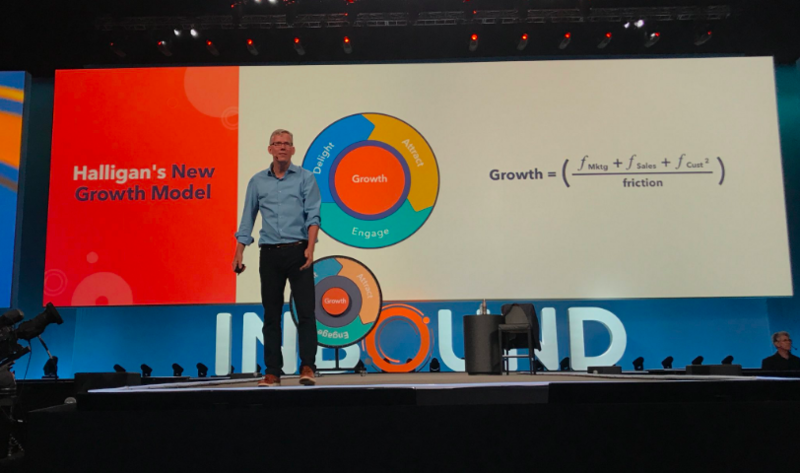 That's why when Brian Halligan revealed the new Flywheel model, I had my Aha moment and felt that finally I can say goodbye to the funnel. A flywheel is an energy-efficient machine which was invented by physicist James Watt about 200 years ago. The machine is designed to capture, store and release energy. The amount of energy it stores depends on how fast you spin it, how much friction there is, and the composition of the wheel itself. Unlike a funnel, where you will lose the energy when you reach the bottom, as long as the flywheel keeps spinning, you can store and release energy. Brian then explained how to grow a business based the most important three things of the flywheel model. Firstly, you need to apply a force to the flywheel. The more force you apply to the flywheel, the faster it spins. Businesses have shifted the weight of forces from Engage, Attract to today's Delight customers throughout the years. As the marketplace becomes more and more competitive and people become more skeptical of sales and marketing, companies start to seek growth opportunities in exciting customers. 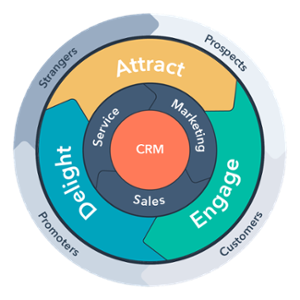 Thus, the key to grow your business is to have a Customer Delight approach in every process of your business: marketing, sales and service. Secondly, you need to reduce the friction. The less friction, the faster the flywheel spins. To gain competitive advantage in today's business world, it is not about providing good products, it is about how companies can get the friction out and creating a light customer experience. Brian gave three tips for companies to reduce friction in the future: increasing customer self-service to 80% and only 20% of interactions with your employees, investing 80% of your IT resources to make your customers more efficient, making 80% of the work done automations and save your human resources to manage more complicated cases. Thirdly, build your flywheel with high quality and scalable materials. Once you have increased the force and decreased the friction, you will create more delighted customers. The more delighted customers, the heavier the wheel is and the more growth there will be. 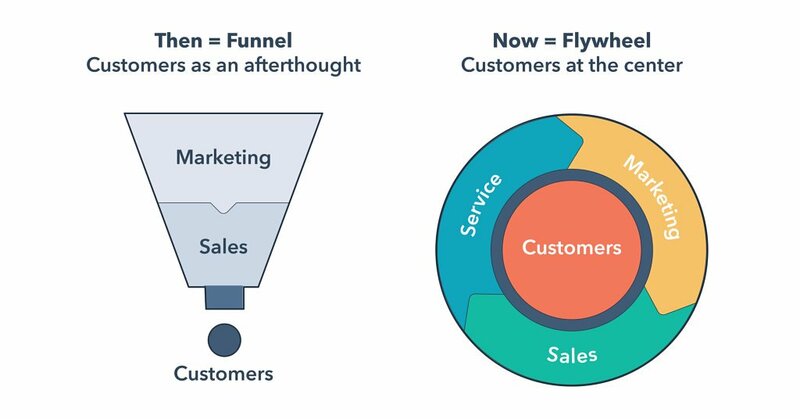 From the funnel's linear approach to a circular process where customer feed growth, the flywheel is an integrated ecosystem that helps customers to create value and grow with the company. Companies should start investing more in customer-centric marketing, customer-centric sales and customer-centric service. At the end of the day, happy customers provide positive energy that fuels that growth. 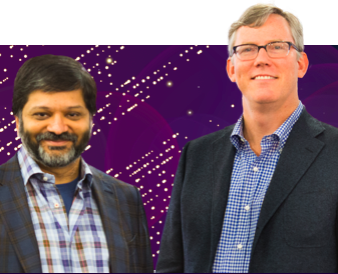 At Connect Labs, we value people and always put our clients in the center of everything we do. 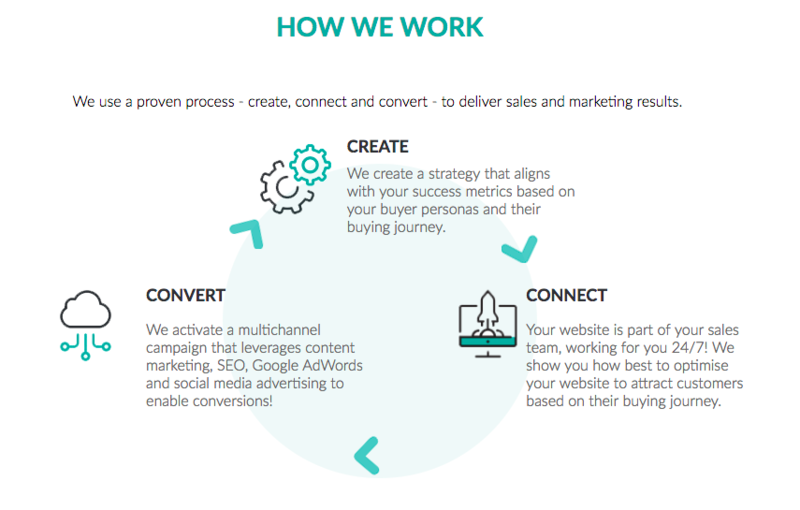 If you look at our process of create, connect and convert we realise that sales and marketing is about continuous improvement, much like the flywheel. So thank you, HubSpot for affirming what we thought was true. Let's map sales, marketing and services to software and spin faster.